It is challenging for emerging companies with $3M to $50 in annual revenue to obtain growth capital . They typically need $1M to $3M for business expansion. But, most banks prefer to lend working capital, not pure growth capital. Per the Bank Administration Institute, more than 30,000 commercial loan applications are declined every day in the United States. Private debt requires high interest rates, hard collateral, personal guarantees and warrants. Additionally, there are inflexible terms and payment schedules along with default provisions. These conditions can lead to foreclosure. As a result, private debt is expensive and cumbersome. Private equity is dilutive, difficult to obtain and requires a rigorous vetting process. Private equity investors considering expansion stage companies are typically looking to invest $20M plus. Additionally, they want a strong say in management. Consequently, they focus on an exit strategy with a maximum return. The owners and investors goals are not in alignment. Flexible, Royalty Based Finance is a unique solution for owners and investors seeking long term growth. Royalty Based Finance or (Revenue Based Finance) has been used for decades in oil & gas, mining and health care. It is now available to businesses in various industries. Royalty Based Finance is an innovative new source of growth capital. It allows emerging companies to expand their business and increase the value of their company without sacrificing equity or taking on cumbersome debt. Royalty Based Finance eliminates the need for private equity or bank debt. Growth capital is provided in exchange for a fixed percentage (1% to 5%) of your monthly top line revenue. Unlike private equity, the business owners retain ownership and control of their company. 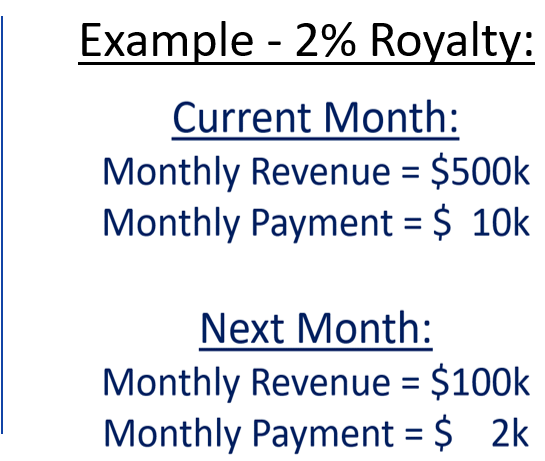 The monthly payment is variable because the royalty rate is fixed. For example, if the company bills $500k and the fixed royalty rate is 2%, the payment for that month is $10k. If next month's revenue drops to $100k, the royalty payment is $2k. Unlike traditional debt, the payment plan is flexible and adapts to your business model. Cash flow friendly RBF is aligned with your top-line revenue targets. You are not penalized for slow months or seasonal circumstances. Royalty payments are structured to last for about 4 to 6 years. Capital provided ranges from $1M to $3.5M per company. Flexible payments continue until the initial capital plus a predetermined amount is repaid. 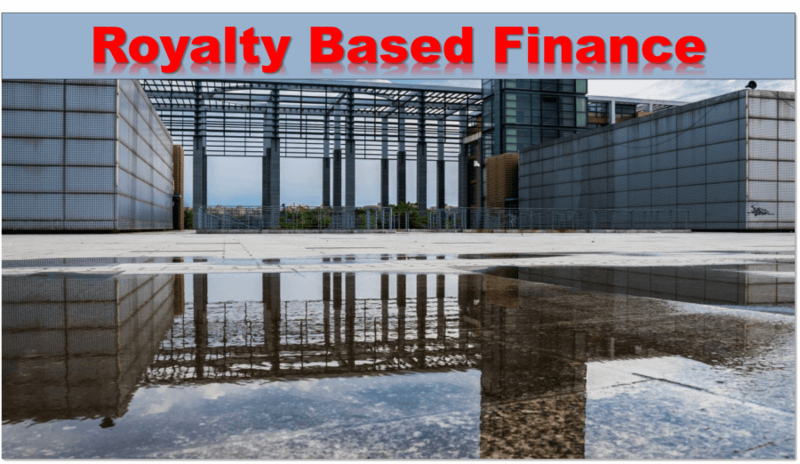 How Can Royalty Based Finance be Used? substantial growth opportunities. For example, expand sales, acquisitions, new product launch, etc.